Born in 1960 in China, Wang Tiande is one of the most significant and innovative calligraphers of present times, internationally renowned for his revolutionary takes on traditional Chinese art. A graduate of the Chinese Painting Department at the Zhejiang Academy of Fine Arts in 1988, the artist is now dean and professor at the Art and Design Department of the prestigious Fudan University in Shanghai. Characteristically using incense sticks to burn symbols, which resemble Chinese characters, onto rice paper, Wang Tiande’s work has been collected by the British Museum, London, Metropolitan Museum of Art, New York, Boston Museum of Fine Art, Hong Kong Museum of Art, Shanghai Museum of Art, Guangdong Art Museum, Shenzhen Art Museum and JP Morgan Bank. Breathing new life into archaic ink styles, the art of Wang Tiande is a masterful coalescence of literati art and contemporary aesthetics. Skilfully using incense sticks to create layers of singed imagery, the artist combines landscape images and diaphanous layers of burned xuan paper to create what has been called ‘Hallucinogenic Cultural Imagination.’ Driving the viewer’s field of vision, the landscape horizons are represented through burnt traces and marks that are as controlled and deliberate as the brush and ink that define them. The dizzying double vision is accentuated by calligraphic elements that provide abstract impositions, exaggerating the palpable sense of weightlessness. Meditating on creation and destruction, the simultaneous ephemeral and fleeting qualities of Wang Tiande are a poetic celebration and elegy to both past and present. The artist’s signature style of double-layered painting consists of ink landscapes illustrated through scripts topped by an upper-layer of burned landscapes, which are then juxtaposed with monotypes from antique steles collected by the artist. In literati paintings, mountains represent the personality and merits of the artist; and Wang Tiande is one of their contemporary virtuosos, expressing his inner awakenings through the expression of his art. 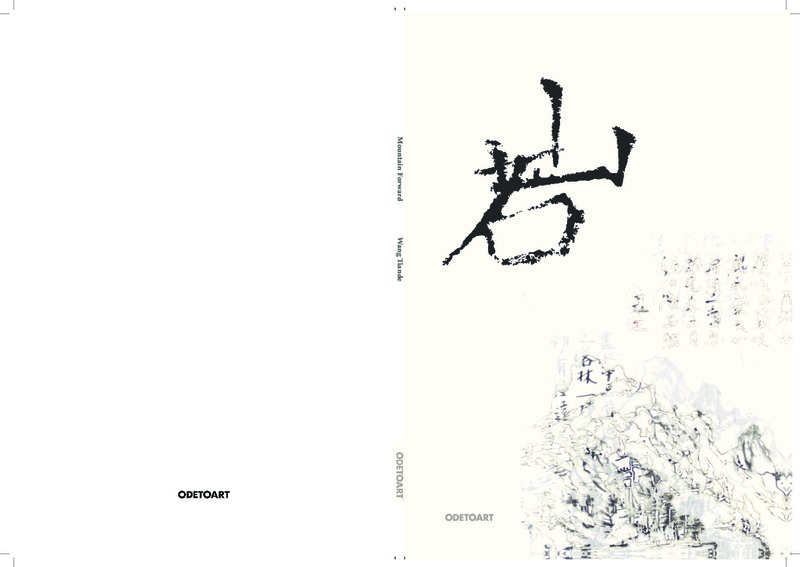 Delving into the conceptual introspections that form the framework of Chinese art perception today, Wang Tiande moves beyond the mountains of history and tradition, moving monumentally forward with revolutionary steps of fire and ink. Born in 1960 in China, Wang Tiande is one of the most significant and innovative calligraphers of present times, internationally renowned for his revolutionary takes on traditional Chinese Art. A graduate of the Chinese Painting Department at the Zhejiang Academy of Fine Arts in 1988, the artist is now dean and professor at the Art and Design Department of the prestigious Fudan University in Shanghai. Recreating Ink brush painting for the twenty-first century, the artist often burns symbols, which resemble Chinese characters, onto rice paper, evoking the essence of traditional Chinese art in a modern context. The burn marks are made with an incense stick, creating shapes and spaces, similar to that of landscapes, water and mountains. Mountain Forward is a solo exhibition of Wang Tiande recent works in Ode To Art .